Large Scale Palestinian Terrorist Attack Thwarted at Kissufim…….. – The Tundra Tabloids……. Tundra Tabloids news analysis: The Islamic Jihad is contracted by the Hamas to carry out a kidnapping attempt against Israeli soldiers, with the hope of ‘sweetening the pot’ in any future negotiations with Israel. In the minds of the terrorists, the more soldiers they have under lock and key -or bones under the soil- the greater the chance Israel will force itself to negotiate for their return, with the full reopening of the borders hanging in the balance. It explains quite nicely why the Hamas is suddenly going through a change of heart, and entertaining the idea, once again, of entering into a “unity government” with Fattah. It seeks to gain much by appearing to play the game, then when the timing’s right, resort to bellicose statements and threats of war with Fattah once their demands for greater power are not met. The Obama administration seems set on trying to court the Hamas into the political arena, as being a part of the solution to the so called, “peace process”, though it’s clearly a fools errand, as the TT and many a good ME analyst (here to) have pointed out for a very long time. The Hamas stands to gain much from the present false rapprochement with both the Fattah and the US, because it has learned as much from the Fattah during the Oslo period in the 90’s. NOTE: Don’t read too much into the Mulsim world’s public messages for Hamas to reject any unity government of peace with Israel, it’s all blue smoke and mirrors Eveything being done now by Hamas, is being done with the intention of resuming of hostilities against Israel in the near future. IDF soldiers foiled a large-scale attack at the Kissufim border crossing against troops or a southern Israeli community, security officials said on Monday. The attempted attack came early Monday morning, when a Golani force spotted two Palestinians laying explosive devices near the border crossing. 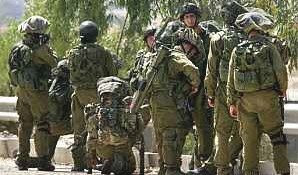 The soldiers crossed into Gaza and exchanged fire with the armed men, who fled. The Golani force then summoned an IAF aircraft, which attacked a car on the scene, apparently the escape vehicle used by the gunmen. Palestinians reported two people lightly wounded following the attack, and said a building was also struck. Previous Post Previous Post UK: Gordon Brown Has A New Old Plan: Bring in Fascism……! Next Post Next Post Swedish Airforce Screwed: Not Able to Transmit Secret Code Messages…….